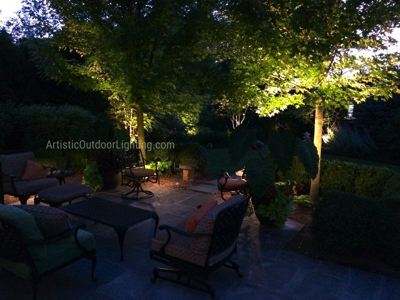 We bring artistry back to outdoor lighting in Joliet IL. We will give you a in-yard landscape lighting demonstration and offer a lifetime warranty. Competitively priced. 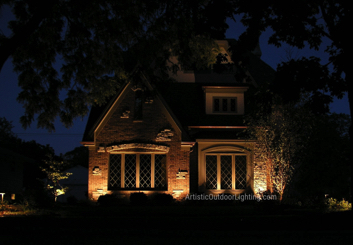 We are your premier source for landscape lighting and outdoor lighting Joliet IL. As 5-time Angie's List award winners serving you for 18 years, we offer 10 year guarantees on all installations and a free in-yard demonstration. We are experts in LED outdoor and landscape lighting and offer the highest level of attention to detail. It's been proven that when intruders see light, they move on to a darker home. Artistic Outdoor Lighting will not only enhance the beauty of your home and property, but your Joliet IL landscape lighting will get the added benefit of security. Feeling safe and secure, especially when you are home alone, is priceless. Also, the ambient light around your home will make paths and walkways safer for you, your family, and guests. You, your family, and guests will be able to enjoy decks, porches, pools, and gardens late into the evening. The amount of space you can use to relax or entertain can be expanded to double or triple the space you enjoy now. You will no longer have to return indoors at dusk. Your Joliet, IL outdoor lighting spaces will come alive and become even more beautiful as the sun disappears. Your home, lit fittingly by Artistic Outdoor Lighting, will take on a subtle, supernatural excellence that will "wow" spectators and provide for you a warm, welcome feeling each time you come back home. The environmental details and landscape components that you appreciate will be improved and come to fruition you will never get sick of seeing. Check out photos of our outdoor lighting to see for yourself! Contact us now and let us show you how we can enhance the beauty and safety of your home and outdoor spaces. We will set up a complete, detailed demonstration that will duplicate exactly the way the final lighting installation will look. There is no guesswork. What you see is really what you get. At the time of the demonstration, diagrams, wiring charts, and photos will be made to ensure exact duplication at the time of installation. No other company goes to these lengths and pays as much attention to Joliet IL outdoor lighting detail. We also offer the latest in energy efficient landscape lighting, including LED and fluorescent lighting installation, ensuring that you continue to get the most cost effective lighting available. In 1833, following the Black Hawk War, Charles Reed built a cabin along the west side of the Des Plaines River. Across the river in 1834, James B. Campbell, treasurer of the canal commissioners, laid out the village of "Juliet", named after his daughter. Just before the economic depression of 1837, Juliet incorporated as a village, but to cut tax expenses, Juliet residents soon petitioned the state to rescind that incorporation. In 1845, local residents changed the community's name from "Juliet" to "Joliet". Joliet was reincorporated as a city in 1852. Today, Joliet is home to places such as the Inwood Golf Course. We provide service throughout Joliet IL, including 60442, 60560.